Corrected two links in my previous posting. Another interesting case from technik's collection in watch.ru, (Ð§Ð°Ñ�Ð¾Ð²Ð¾Ð¹ Ñ„Ð¾Ñ€ÑƒÐ¼ Watch.Ru - Ð�Ð»ÑŒÐ±Ð¾Ð¼ Technik: Ð§Ð°Ñ�Ñ‹,ÐºÐ¾Ñ‚Ð¾Ñ€Ñ‹Ðµ Ð½Ð¾ÑˆÑƒ) - Ð˜Ð·Ð¾Ð±Ñ€Ð°Ð¶ÐµÐ½Ð¸Ðµ). Now: updated version of the Komandirskie list. As before, information requests are in italics. I have left out the "cadet" and the "wren" (flared lugs and 2 o'clock crown for female navy officers) for now. The classic Komandirskie sports watches with rotating bezels: case made from brass, the first two digits refer to its case design, third digit of "1" means chrome plated brass, "9" means titanium nitride finish which gives a gold tone, but harder-wearing than gold. 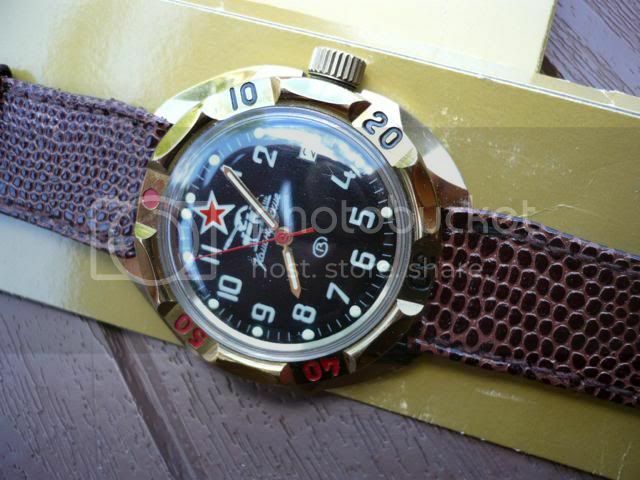 Vostok's appellation system also says "3" means gold plating, "6" means black finish, but apparently they are not used on this series of watches. Characteristics: with smoothly extending crown guards. When seen from the front, the bezel covers the case perimeter between the lugs at each end. Note: While it is discontinued, this appears to be a most common Komandirskie case style. Most examples seen appear to have flat-ended crowns but those with equally large dome-topped crowns are not unusual. Robert Prochowicz's 3073 has an unusual, perhaps non-standard bezel fitted which is smaller. The case design, however, has been revived in the New Komandirskie models, but in steel and black finish, with larger case back for automatic movement. Characteristics: originally the design was known as Generalskie, and resembling Type 34x but slightly bigger. When viewed from the front, the case perimeter can be seen between the lugs, not obscured by a standard bezel. Note: Most examples are signed Komandirskie, but some are signed Generalskie, Admiralskie, or even Albatross. Note: Most examples appear to have larger size dome-topped crowns but those with flat-ended crowns have also been recorded. Characteristics: Cushion case as type 33x but with 3 o'clock crown. Note: Compared to the type 33x case, this version appears to be more scarce. Note: The 92x case uses a larger case back about 35.5mm diameter, and takes a 32mm movement ring. *There is an earlier type with identical external appearance, but uses a flat case back about 31mm in diameter, hand-wind movement, takes a 29mm movement ring and with a single case back locating slot, as per others with hand-wind movements. This needs looking into. Characteristics: case with stepped extensions towards the lugs, very small crown guards. Characteristics: round case with angular tapering lugs and wide crown guards. Characteristics: round case with flared lugs and small crown guards. Characteristics: round case with comma-shaped lugs, no crown guards. Note: first made as Generalskie, from 2004-5 sold as Komandirskie. Some examples have dials signed Admiralskie. Characteristics: a newer, more angular design, the corners of the strap at the lug ends are particially obscurd by the lugs. Note: This is a short-lived design made for only a few years, and is unique as it is the only one housing the hacking 2434 movement. Characteristics: small flared lugs, narrow crown guards. 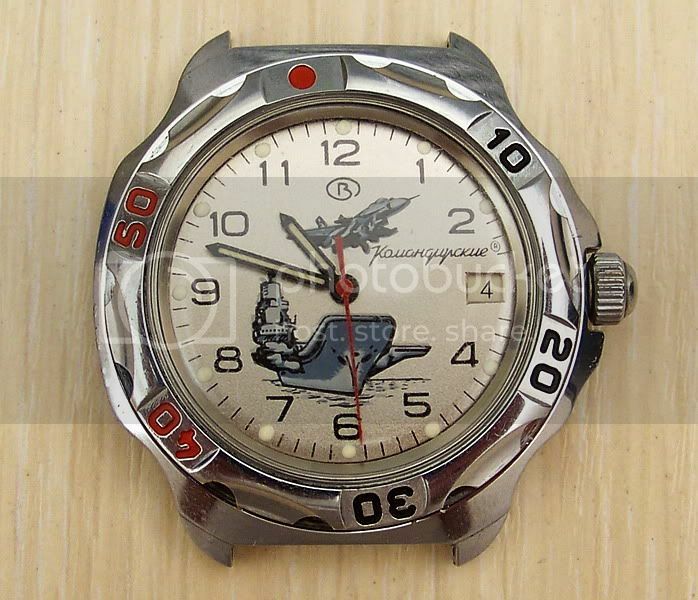 Note: Usually with black bezel and released as commemorative editions, such as anniversary of the end of WWII. Characteristics: resembles type 34x but with a more gentle curve on the right hand edges, thus having smaller crown guard. Apparently this design was only used with the 2424 24-hour movement. Characteristics: generally oval in shape with rounded lugs corners, and has a large semi-circular crown guard which shields almost the whole length of the crown. Note: This appears to be a relatively scarce model, the few examples recorded appear to have somewhat unusual bezels too. Characteristics: bears a resemblance to Type 34x but with sweeping curves on he right side, the bezel touches the curve when seen from the front. Characteristics: oval shape, asymmetrical as the crown side is wider. Characteristics: case is asymmetriccal like the previous model, but with larger, angular lugs of a style which resembles some 1MWF Kirovskie models. Characteristics: large oval case with four scallops cut around its edge. Last edited by Seele; September 1st, 2010 at 20:58. Wouldn't it be better to put the latest information right at first post (and editing it whenever there are updates) ? I did try to do that, but after a few weeks, an earlier post would be locked, making it impossible to edit it. Thank you for your input, I have added the data to the latest list. 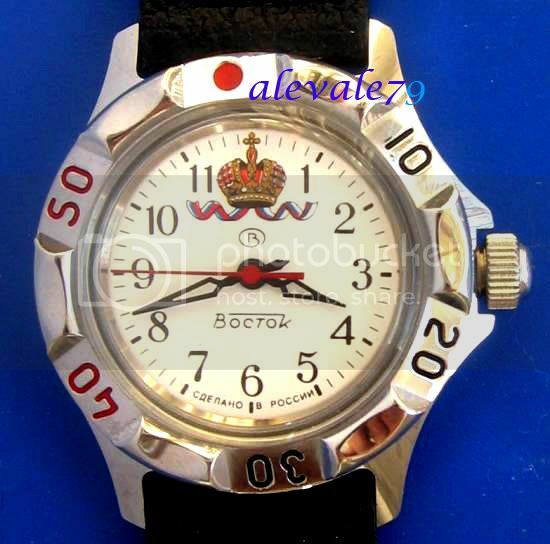 A longish 24-page thread on watch.ru dedicated to 300 m. amphibian (http://forum.watch.ru/showthread.php?t=7502&page=5). Besides the famous and well documented 300 m. tonneau case, there are at least three 300 m. amphibias there with earliest round case / swivel lugs (case 350 in your classification) – posting n. 48 on page 5, posting n. 64 on page 7, n. 59 on page 6, posting n. 76 on page 8, n. 117 on page 12, posting n. 154 on page 16. There are also two 300 m. amphibias with octagonal case (type 470) – postings n. 176, 178 on page 18 and n. 225 on page 23. It seems that the 300 m. line existed in parallel to the 200 m. line for quite a few years. Thank you storyteller for the tip; much appreciated. As I do not know the Russian language I certainly do not hang out at that forum. Looking at the pictures, I don't seem to be able to notice any significant difference between the standard 200m Type 350 and the 300m version, although I can see the Type 470 has been beefed up significantly, both in case thickness and crystal thickness for the 300m version. Again, my latest Amphibia listing has been locked against editing by me; I will think of something: perhaps generating a multiple-page pdf file, one page for each type, and then make it available for download from my business site? I'd welcome suggestions. 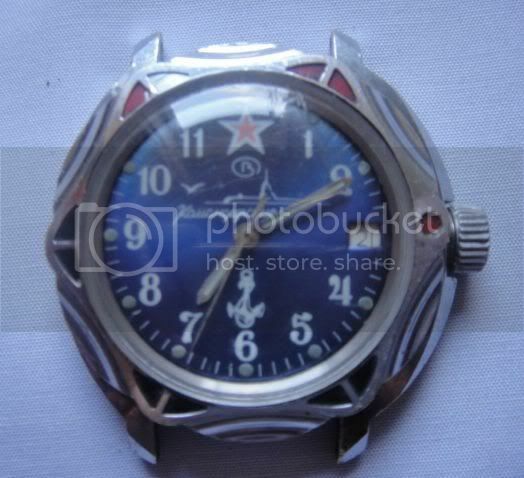 A trawl around eBay located an unusual Komandirskie, and checking it against the Vostok 2001 catalogue confirmed it to be Type 74x; the list above has been updated to include it. Last edited by Seele; September 1st, 2010 at 21:01.